Get your binoculars and checklists ready! The Coastal Bend is the only spot in the United States where the endangered whooping crane can be viewed at close range. 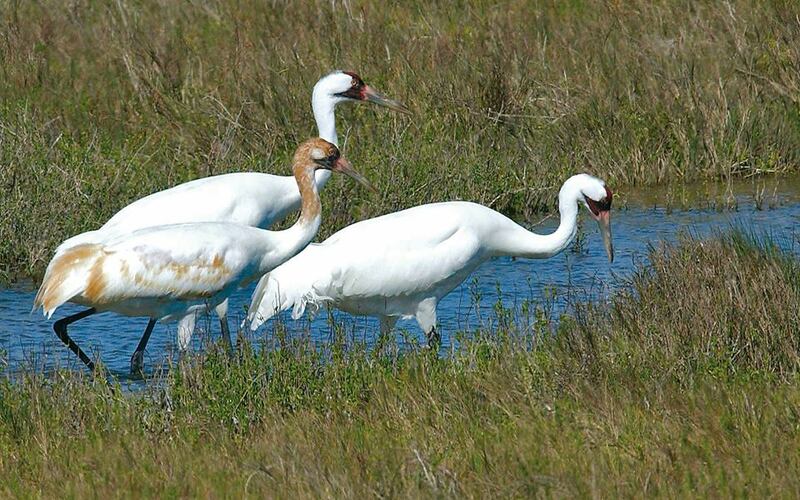 The Port Aransas Chamber of Commerce celebrates the Whooping Crane Festival, an annual festival honoring these majestic, grand birds. The Coastal Bend is the only spot in the United States where the endangered whooping crane can be viewed at close range. You do not have to be an ornithologist or even a birdwatcher to enjoy this spectacle ... its always great to be outdoors and if these birds bring you out than even better. In addition, birdwatchers and birders and novices alike can discover an awesome array of wintering migratory birds as they flock into the wetlands and onto the Texas shorelines of Mustang Island in Port Aransas. Birding tours by land and sea are highlights during the festival. Visitors of all ages will enjoy the many festivities during this celebration. The free trade show featuring numerous, unique vendors. These vendors will supply a wide selection of photography and paintings, and one of a kind gift items with nature as the theme.